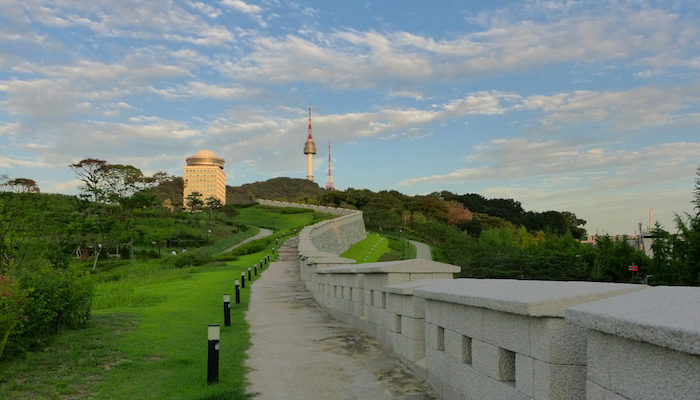 900-foot high South Mountain (Namsan Park) is an oasis of green, right in the center of Seoul. There are about 10 km of paved paths, offering multiple running options. For those who want a challenge, there are five ways to get to the top. The best option the 2k climb from the Seoul Arts center to the Seoul Tower, at the summit. There are great views. A good place to start is the Sungnyemun Gate (also known as Namdaemun Gate), a pagoda-style gate that was one of the old entrances to the city and dates back to the 14th Century. 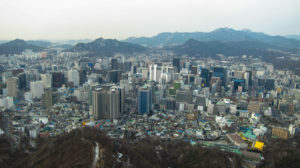 From there, turn left onto Sowollo road and continue until the base of Namsan mountain, about 2km. The paved mountain run starts there, a steep 1km climb to the top. One can then run back down the other side of the mountain, with viewing decks along the way, to do a loop.